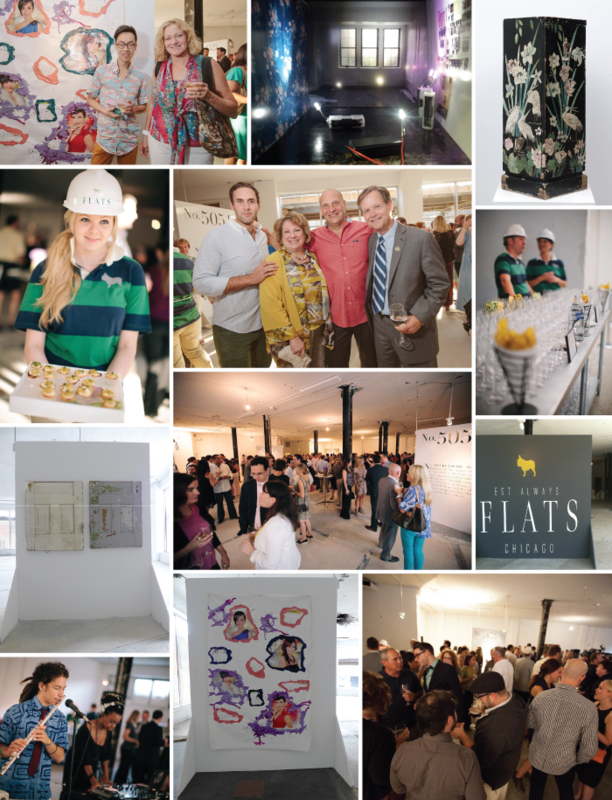 The FLATS Chicago launch event, held at FLATS Studio No. 1050™, was a evening of celebration and collaboration. For several months, members of the FLATS Chicago family branded a collection of lifestyle apartment properties that accentuated “big style /smart spaces™” through hotel-inspired living, creating a new class of rental experiences. The FLATS™ brand esteems itself on its carefully restored buildings, reclaiming pieces of their past to signify their rich vibrant history, creating a new high quality, amenity rich environment available in the Uptown, Edgewater, and Andersonville neighborhoods. The FLATS Studio pop-up gallery featured a talented artist by the name of Young Sun Han. His work had been seen on Bravo’s Work of Art: The Next Great Artist, galleries across the world, and was at our fingertips for our own personal viewing. Han created a series of art installations that represent our new collection’s true meaning, value, and authenticity behind the FLATS Chicago brand. He salvaged materials from each one of our featured properties, and put together a show that was just as strong as the brand itself.